WHILE WE WERE YET SINNERS…… Those are strong words, aren’t they? These words hit me some time ago, but I’m have to remind myself and the ones He brings into my life, that His word tells me He died for me. Why? Is it because I’m good enough, righteousness enough, strong enough, and perfect enough? No! It says He died for me and loved me as a sinner! Not a perfect Christian. Not a perfect wife. Not a perfect mother. Not the righteous, not the wise, and not those who have it all together. He died for the poor, sick, weak, sinful, broken-hearted and for those in chains! When I look back on while I was yet a sinner…. That’s a scary place. I, probably like some of you, had some very hard times as a child. My dad left when I was 3 years old and from then on I struggled with insecurities. I sinned a lot, I disobeyed my parents, I wasn’t kind at times. I gossiped and I looked for my daddy’s love in all the wrong places. But Romans 5:8 came to life when I became a teenager. I saw my true NEED for Him in a real way. I knew I couldn’t live any longer in that life. And I knew that even if I didn’t feel the love of my earthly daddy, I did have a Heavenly Daddy that loves me–a sinner. He died for me! For you! He loves us more than we can ever imagine. Remember He died for you while you were a sinner. He takes you from ashes to beauty. If you already know the true love of your Heavenly Daddy, embrace it today! Remember where He brought you from. Remember and praise Him for loving you and saving you from yourself! 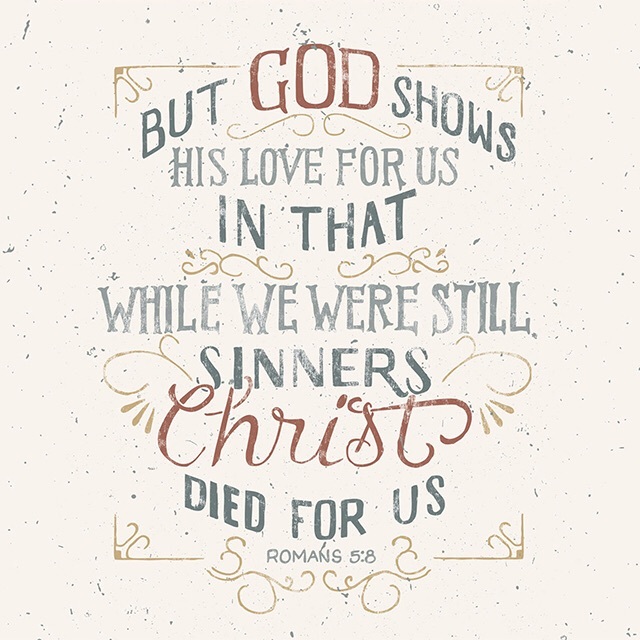 If you haven’t ever experienced His love, and sin has a stronghold on you…. turn to your Daddy. He is waiting to save you. Let Him call you, redeem you, and unconditionally love you!